There was so much covered in this thick, large paperback that it is difficult to decide what group of people it was intended for. Teachers and parents, definitely. I understand how this book came up in other books I've read and that's why I decided to read it. Wow. Enjoyed the author's writing style and her humor had me chuckling throughout the 462 pages. The author presented numerous in-depth background examples and used them throughout the book. There was a tremendous amount of research that floored me. Normally, I would have been put off by the length of time it took to get to a point, but in this case it was completely necessary. The author was discrediting many long-standing, hard and true, beliefs and had to set the stage before she made her point. She made her point(s) in spades! The end of the book, starting at Chapter 12, Growing Up, I found the most fascinating. Here she talks about peer pressure, family groups, teen smoking, playing piano (or not), family units, kids at school, to spank or not to spank, child abuse, birth order, sibling rivalry, what's learned behavior at home and what's learned from peers, choosing schools, bullying, social skills, self-esteem and status, parents as pals, siblings as allies, etc. Very interesting. The book uses quite a few examples of how nature (genes) are more responsible for our behavior than our environment (nurture). Many examples of identical and fraternal twins raised together and apart. One that I want to share were two identical twins raised apart. The biological mother played the piano. One child was raised by a mom that taught piano lessons. The other child was raised by a parent who introduced her child to a piano teacher and provided the resources, not the expectation, to learn to play. Guess which child played the piano? The latter. It was felt by the first child that that particular role in the family was already filled, so that child was not interested. The author says too bad they didn't introduce her to the Tuba. Not a quick read by any means. There was a lot of information to sift through and this book is not for everyone. I bookmark-tagged the heck out of it! 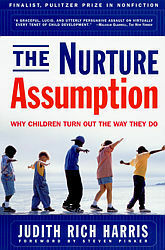 Sign into Goodreads to see if any of your friends have read The Nurture Assumption. 11.69% "Enjoying the humor & hearing summaries of prior research from various fields. Nature v Nurture, twins raised apart (together), birth order"
59.74% "Getting into the adolescent "stuff." Enjoying hearing different sides of opinions....with humor!" 100.0% "Interesting ideas. Tremendous amount of research and I liked how the author expressed multiple viewpoints. A lot to mull over."